I knew someone from Lubbock, Texas and he used to play country music on a Fiddle (violin). Him and friends would get together down at a small washeteria on Saturday morning to practise music for a band. He told me about everytime they would get together Buddy Holly would drop by wanting to play with the different guys; they would get mad and try to get Buddy to change to country music. 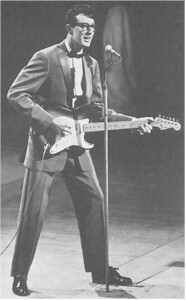 Later many of the older guys after hearing how Buddy Holly made it great thought maybe they should learn Rock-nRoll. My friend is an Air Traffic Controller in Lubbock, Texas.